Rubber Acrylic Adhesive Labels | MIDCOM Data Technologies, Inc.
What makes some labels stick so well? There are 3 kinds of adhesives that we are going to talk about today, the temporary rubber, the resistant acrylic, and the sensible acrylic blended adhesives. Rubber adhesives come off easily. They’re good for temporary applications, and a great example of a rubber adhesive you may have heard of is the sticky side of a Post-it note. Many rubber adhesive labels are used for inventory that moves around a lot. They come in all different sizes, are similar in the way they are printed on from acrylic labels, and similar to your standard label. They will peel off if placed in direct sunlight, so don’t even try to stick one outside. It’ll fall to the ground in no time flat. The paper is also a bit more fragile than other adhesives, so they’re useful for delicate applications. If you’re in a climate controlled, such as an air conditioned area, they’re a great option for temporary application. Also, there is absolutely no residue left behind when you take off the label. Acrylic labels are much more permanent, and I would take a guess that Lucy’s bull dog cement glue was an acrylic label. They’re great for if your inventory is not going to move, or you’re positive you’re not going to want to take the label off for a really long time. Acrylic adhesive is also resistant to heat, cold, and rain so you can place them outside all year long. That’s why they’re great for bumper stickers, too, since nobody ever regrets a bumper sticker on the back of their car. Last we have the acrylic blend adhesive label, which is the best of both worlds. It will stick to anything. I mean anything, from plastic to cardboard, metal to wood, this adhesive does not discriminate. They’re a bit sensitive to the sun, and will peel with exposure, but they’re a bit tougher than the rubber adhesives in general so they can be used in more robust applications. On top of that, they’re easy to remove, so you don’t have to commit to the sticker forever, like you would with an acrylic adhesive label. Lastly, please don’t try and glue chickens together! 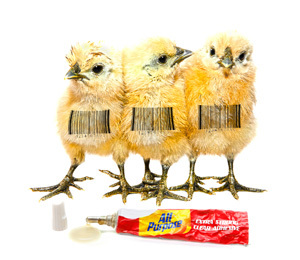 Adhesives can be an afterthought when you’re looking for barcode labels. It’s easy to get carried away with size, textures, and other considerations and forget that your adhesive is important. To learn more about custom labels click here. Think about your adhesive before you purchase your barcode labels. With any more questions you can always call MIDCOM at (800) 643-2664 or chat us up on Facebook, Twitter, Google+ and LinkedIn!